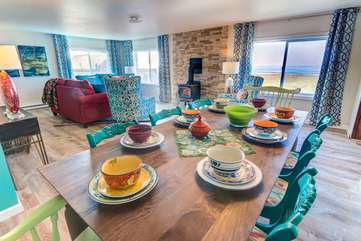 Enjoy a wrap-around view while dining or just relaxing. 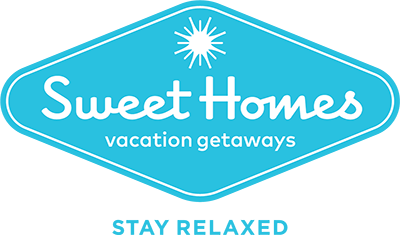 Sweet Homes Rentals brings you this amazing, beachfront, 2 story home and lets you vacation in comfort! It sleeps up to 10 people, with 4 bedrooms and 3 bathrooms. This home is a dream -- offering absolutely stunning views of the big sky and swaying ocean, and crashing waves on the rocky shore. The stormy days are as special and memorable as the clear sunny ones here! You will love the tasteful and elegant decor, the beautiful layout of the home, and the many amenities. A gas fireplace, an organ, a large ocean front wrap-around deck overlooking the 804 Trail and the ocean, a wet bar in the lower queen bedroom, and much more, make this home a rental dream! The hot tub is shielded from the wind, and when you're done relaxing outside, you can come enjoy the garage game room, featuring a slate pool table, ping pong table, and foosball. We also provide free WiFi, a gas grill, a stereo system with iPod dock, flat screen TVs, and collections of books and games for your enjoyment during your stay. Open the windows and relax to the rhythmic sound of the surf right outside. This home is perfect for a romantic getaway, a family vacation, or a quiet and stunningly beautiful ocean holiday with friends. Sleeps up to 10 - 4 Bedrooms: 1 King; 2 Queens, 2 Queen sleeper sofas, Twin Trundle (sleeps 2) and an Aerobed, 3 Bathrooms. Standard: 2 night minimum; Mid-Season: 3 night minimum; Summer & Holidays: 3-4 night minimum. **Oct. 1st - May 31st The third night is FREE - excluding holidays - please send inquiry for exact pricing. (lowest listed rate is free) ** Cancellations & Refunds: The total cost of the reservation, less a 10% service charge, is refundable up to 45 days prior to check in. After the 45th day to check in has passed, there is no refund. Check-in any time after 4:00pm on your date of arrival. Age Requirement: The primary registered guest must be at least 26 years of age. The majority of guests must be over 25, or children under adult supervision.